Leveraging the work on 3D channel modeling completed in Release 12, 3GPP RAN will now study the necessary changes to enable elevation beamforming and high-order MIMO systems. Beamforming and MIMO have been identified as key technologies to address the future capacity demand. But so far 3GPP specified support for these features mostly considers one-dimensional antenna arrays that exploit the azimuth dimension. So, to further improve LTE spectral efficiency it is quite natural to now study two-dimensional antenna arrays that can also exploit the vertical dimension. Also, while the standard currently supports MIMO systems with up to 8 antenna ports, the new study will look into high-order MIMO systems with up to 64 antenna ports at the eNB, to become more relevant with the use of higher frequencies in the future. Details of the Study Item can be found in RP-141644. The idea is to introduce carrier and UE specific tilt/beam forming with variable beam widths. Improved link budget and reduced intra- and inter-cell interference might translate into higher data rates or increased coverage at cell edge. This might go hand in hand with an extensive use of spatial multiplexing that might require enhancements to today’s MU-MIMO schemes. Furthermore in active antenna array systems (AAS) the power amplifiers become part of the antenna further improving the link budget due to the missing feeder loss. Besides a potentially simplified installation the use of many low power elements might also reduce the overall power consumption. At higher frequencies the antenna elements can miniaturized and their number can be increased. 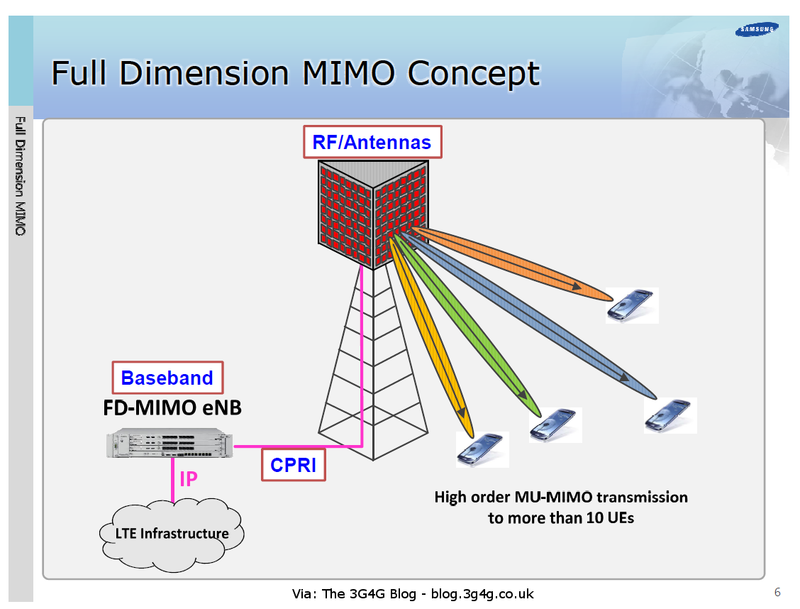 In LTE this might be limited to 16, 32 or 64 elements while for 5G with higher frequency bands this might allow for “massive MIMO”.